QuinnBet are one of the latest betting sites to launch on the FSB Tech platform. What does this mean? FSB provide the sportsbook and casino platform including the odds, general layout, banking options and features, they also hold the UK gambling license. Quinnbet then supply the content, branding, games and decide on what promotions and markets to offer. The benefit of using a platform such as FSB is the sportsbook is ready out of the box allowing the company to then focus on providing a unique product for their customers. 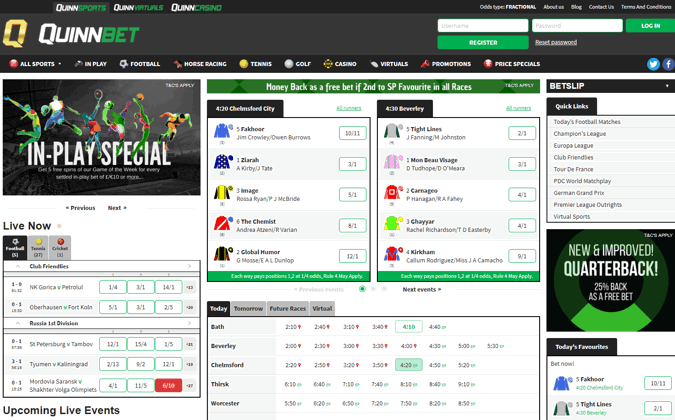 Quinnbet, although new, are impressive and have far more going on than most other bookies and most other FSB brands. For example, they provide a lot of markets and more promotions than some of the biggest established betting sites. 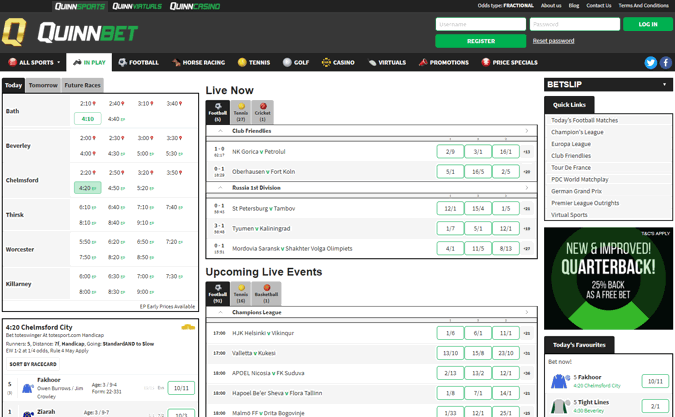 If you are looking to try a new sportsbook in the UK you could do far worse than give QuinnBet a go. Deposit (card only) and wager £10 or more at evens+, if this first bet loses get a £10 free bet (use at 1/2+, any markets) plus get 10 free spins whatever the outcome of the first bet. Spins for a select slot game, worth £0.10 each, cash winnings up to £20. Both awarded within 48 hours of bet settlement, expire after 7 days of issue. 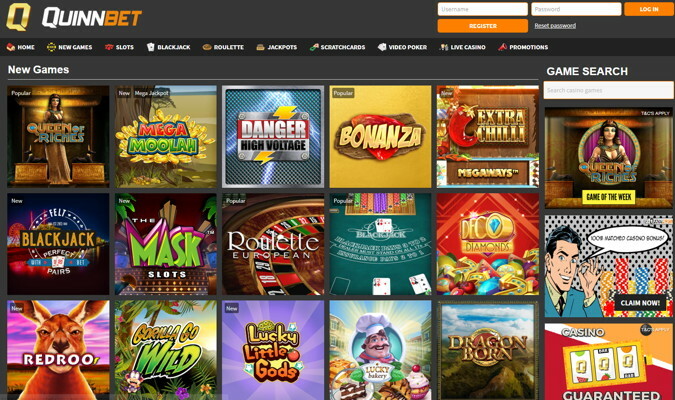 QuinnBet provide a casino and virtuals section for those that like to play games. If you prefer there is an alternative introductory deal available for the casino section if you think you might get more use out of that, for details of this click the button at the bottom of this section. The casino has everything even a more seasoned player could want, and much more than you might expect form a newer brand. You will find in the region of 400 slot games with 10+ jackpots, 15+ varieties each of blackjack and roulette along with scratchcards and all major live casino games. Games come from top providers such as NetEnt, Microgaming, Big Time, NYX and others. Similar to the sportsbook, and in fitting with the ethos of the company, there are numerous promotions for existing gamers including cash back and free spins offers on a very regular basis. QuinnBet is the best betting site for a long, long time at rewarding existing customers. They have set their stall out early as a brand that wants to generate a loyal user base and this is evident by the plethora or long term and short term deals you can access through the site. They don’t boast much in the way of features or things like streaming but are worth opening an account with for choice of offers alone. Over time you could find some good extra rewards by doing do. In fact, the last time a betting site came along and changed the industry so much with their offers was Paddy Power, it is no coincidence that Quinnbet herald from the Emerald Isle too. The sportsbook is FSB powered, this is one of the most easy to use platforms there is, dispensing with the faff to give punters a no frills but hugely functional experience. Any proper punter will immediately see the benefits in betting with Quinnbet, they have got their priorities straight from the outset. QuinnBet are an exceptionally strong brand for regular customer promos, more in the Paddy Power bracket than say BetVictor. There is seemingly every major type of deal to choose from, from longer term loyalty free bets and accumulator bonuses to event-specific price specials, insurance, money back and free-bet deals. For their offers alone it is probably worth holding an account with Quinnbet, they may not be that well known but very often you could find yourself getting better value through them. In a sign of their seriousness they have a lot of horse and greyhound racing deals, from best odds guarantees, lucky bet bonuses to money back second. Most betting sites avoid these sports in general when the launch, many would not even provide racing, QuinnBet however clearly mean business delivering a racing section that beats many bigger operators. They are also Irish which helps to explain why they understand what actual bettors want. In terms of long term loyalty expect to find more than one multiple bet promotion at any one time, a weekly free bet club and in-play specials. There are also plenty of cash-back promos flying around and none of this is hard to find either so you have no excuses for missing out. You can read more about the outstanding Quinnbet exciting customer offers in our promos section. Features wise things are a little light on the ground right now, although judging by how much resource has been applied to the sportsbook and promotions I don’t think it will be long before you can cash out, etc., with them. They do currently offer greyhound racing streams with horse racing to follow in the near future. The live betting in play section is almost perfect because of its simple no frills approach. This is one element that I think many sites over-think, after-all what we want as punters when betting live is to have choice of markets but find them quickly. This is exactly what you get with QuinnBet, and in fact all FSB brands in general. Quinnbet are based in the Republic or Ireland and provide sports and casino online services to the UK and Ireland. The company are wholly Irish owned and this is a real plus for punters. The name comes from Sean Quinn, the former multi-billion business owner who made his fortune in construction and insurance. He was eventually ousted from that business due to debts and eventually went bankrupt, but seems to have come back from the ashes with a renewed vigor to set up one of the best online bookies, and one to watch for the future. This isn’t owned by some investment company looking to squeeze as much profit as possible, rather it is backed by Sean and his family who simply want to grow their brand while at the same time giving customers a positive betting and gaming experience. At the same time the company is clearly well resourced, which is perhaps why they are able to compete on such a high level, and this means there is very little risk of them disappearing all of a sudden. The company have gone to great lengths to make their product entertaining and they have certainly succeeded. On the face of it this seems like A N other new site but once you’ve actually bet with them and spend more than a couple of minutes on the site you see immediately why they are different to the norm. A lot of companies claim to be concerned about the customer and claim to provide a fairer way to bet. Most of the time this is just bullsh*t to get you on board. I genuinely believe this is the case with Quinnbet, you can see a heart and soul in this brand you don’t get with many others. I hope they keep this up and don’t sell out in the future and I think those that try them out early on will see a lot of rewards come their way. You can use debit or credit cards as well as Neteller or Skrill to deposit and withdraw, and you will struggle to find many new sites that offer more initially. One draw back is that currently you can only contact support by email, they really do need to add live chat and ideally phone support soon as this is one thing that lets them down right now. Saying that they are very quick to respond on the two emails I’ve sent them.